Bonfire Sampler / from Sister Sampler Quilts Book (2016) Available in print as 1 of 3 samplers in Sister Sampler Quilts Book. Make traditional skill-building blocks, then lay them out in a stunning fun setting. 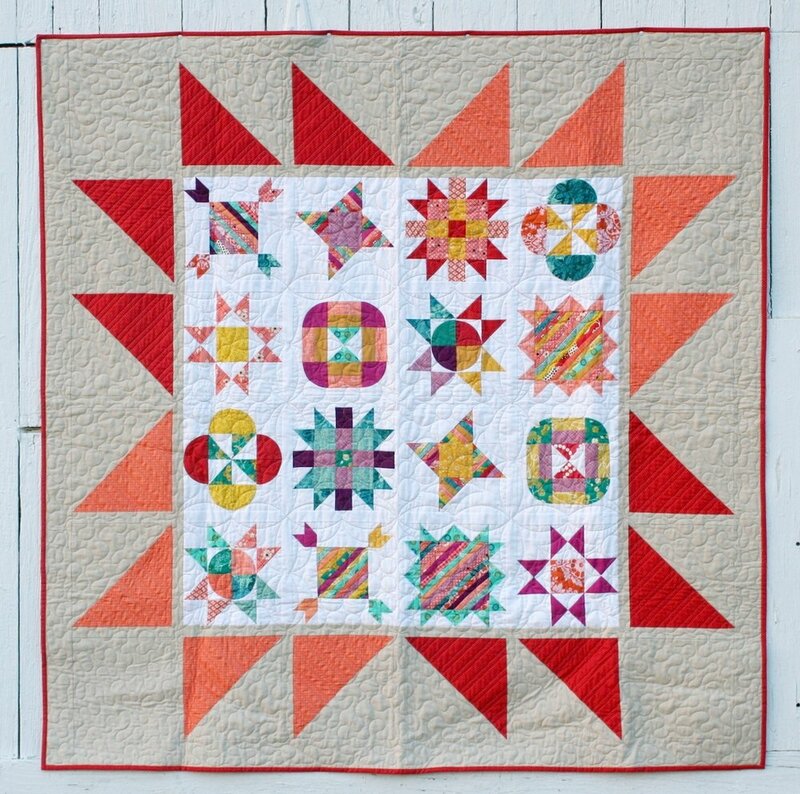 There are 16 skill-building sister blocks (2 each of 8 block patterns) and frame them in a setting reminiscent of a starburst or bear's paw block. The BOM works from the book, Sister Sampler Quilts (1 of 3 samplers in the book). Finished Quilt Sizes: Choose - 64" x 64" (9" x 9" finished blocks) OR 82" x 82" (12" x 12" finished blocks). Instructions for both sizes are included in the book. Designed as 10-Month BOM. Every month, participants will make 2 blocks - a "set" or "pair". Each pair are called "Sister Blocks". Making BOM blocks in pairs allow you to learn as you work. By making two of each block, we can play, improve upon our fabric selections, or try out something different. SENTIMENTAL - The Sister Swap (Optional). After you complete your blocks, you keep one and pass the other to your partner. In the end, you both will end up with a quilt where half of the blocks are made by yourself and half of the blocks are made by your partner. A sentimental keepsake. Click here to download the Bonfire Coloring Sheet.